True quality content restoration requires commitment to facilities, thorough training and organization. Learn more about the process here. Avoiding plumbing overflow is important to prevent water damage and possibly higher fees. Learn how! Internal structures, like water pipes, need to be maintained, as well. If not, it is possible that your pipes will burst. Asbestos was a popular ingredient mixed in home construction materials because of its fire-retardant and thermal insulation properties. What makes plumbers different from water damage restorers, however, is the gravity of the situation. When you remodel your home, or are still planning on remodeling it, there are a few things that you need to think about before going ahead with such a plan. Normally, air ducts that are in perfect condition only need to be cleaned every three to five years. 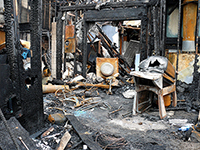 In the event of a fire, it’s not just the flames that will cause great property damage. Smoke and soot is just as harmful. Here's why. Not that many are familiar with residential fire sprinklers, but many know of sprinkler systems being used inside office buildings and other establishments.